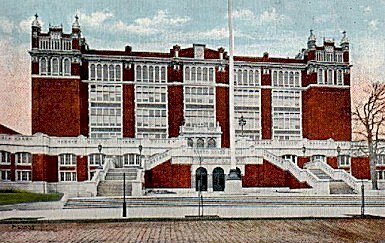 The old Central High School building on Martin Luther King Jr. Blvd. (formally High Street) still stands. The lower front portion has been demolished and replaced with an indoor swimming pool. The building is in the University district, surrounded by New Jersey Institute of Technology and Rutgers, Newark. Nearby is Essex County College and the University of Medicine and Dentistry. It would be hard to find, anywhere in the country, or for that matter in the world, a more complete or a finer building of its kind, than the recently completed Central Commercial and Manual Training School. The location and purposes of this school, which cost $560,000, are told in its title, but there is much about it that its name does not indicate. Situated near the centre of the city, this building, with an unfinished fourth story that may be easily and inexpensively completed when needed, provides accommodation for 1,200 pupils. In the building there are more than seventy rooms of different sizes, a large auditorium with a seating capacity of 1,000, a gymnasium and running track, shower-baths and dressing rooms. In addition to the regular English high school work, provision is made here for the study of domestic science and arts, including millinery,sewing, home sanitation, cooking, nursing, etc. To facilitate the teaching of these studies there is a model dining room, bed room and bath room and a kitchen and pantries. Other rooms are provided for business practice, typewriting and manual training, including forge work, pattern and wood work, sheet metal work and free hand and machine drawing. The machine shop is 100 feet in length. 1,200 pupils capacity, with an unfinished fourth story to be completed as the needs demand. There are more than seventy rooms of various sizes and a large auditorium with a capacity of 1,000 sittings, gymnasium and running track provide, together with showers, dressing room, etc. In addition to the regular English High School work, rooms are provided for the study of domestic science and arts, including sewing, millinery, home sanitation, nursing, cooking, etc. with a model dining room, pantries, bedroom and bathroom, also business practice and typewriting, manual training, including forge work, pattern work, sheet metal, joinery, wood turning, free hand and machine drawing, etc. The machine shop is 100 feet in length. Wash rooms and locker rooms, for the storage of the pupils shop clothing adjoin the various shops. Two large lunch rooms and a kitchen occupy a portion of the fourth story.